The results of the composites, unsupervised and supervised classification and Land Change Modeler were promising. Taking the time to prepare training sites and signature files proved to be a worthwhile endeavor in that the FISHER LDA, as a means of classification, gleaned significant improvement over the Idrisi Cluster module results in this project. 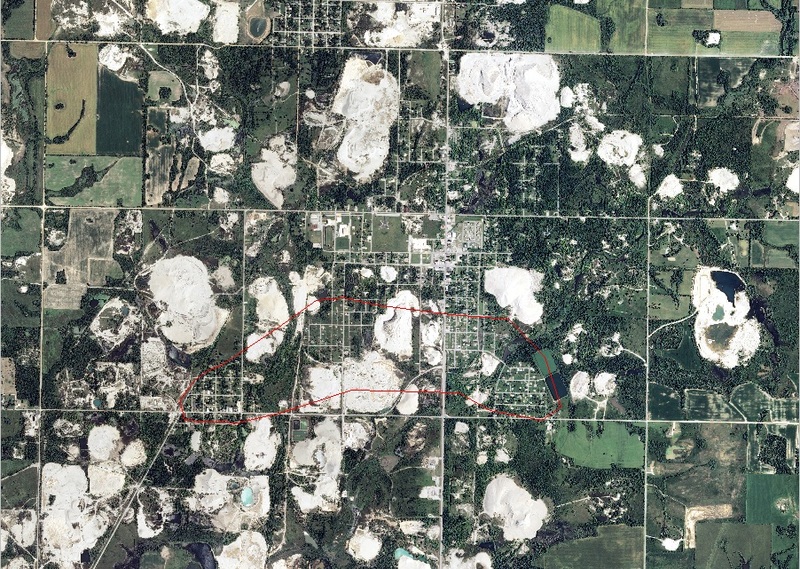 In a tornado that leaves a wider path of devastation, such as in the Joplin, Missouri EF-5 tornado, Landsat imagery would be sufficient for pinpointing the path of the storm.It was discovered that the Landsat imagery was not sufficient in resolution for pinpointing with confidence the landscape changes resulting from the 2008 Picher tornado. Every effort was made to utilize natural color composites of Landsat imagery for reference in each step of the project except in examining the Picher area for evidence of the 2008 tornado. To aid in closer examination of the Picher tornado’s path, National Agriculture Imagery Program (NAIP) images, obtained from Shellie Willoughby, Oklahoma Conservation Commission (OCC), were examined. NAIP imagery is acquired at a one-meter ground sample distance (GSD) with a horizontal accuracy that matches within six meters of photo-identifiable ground control points, which are used during image inspection. The default spectral resolution is natural color (Red, Green and Blue, or RGB). Another benefit of NAIP is that it usually only has no more than 10% cloud cover. NAIP imagery products are available either as digital ortho quarter quad tiles (DOQQs) or as compressed county mosaics (CCM). Each individual image tile within the mosaic covers a 3.75 x 3.75 minute quarter quadrangle plus a 300 meter buffer on all four sides. The DOQQs are geotiffs, and the area corresponds to the USGS topographic quadrangles. 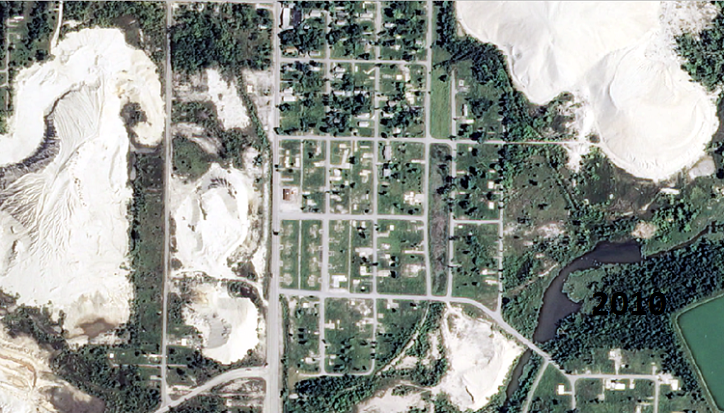 The 2006 and 2010 NAIP imagery were CCMs which are generated by compressing digital ortho quarter quadrangle image tiles into a single mosaic. The mosaic may cover all or portions of an individual final product. All individual tile images and the resulting mosaic were rectified in the UTM coordinate system, NAD 83, and cast into a single predetermined UTM zone, in this case, 15N. CCMs from 2003 - 2007 are all in a .sid format. 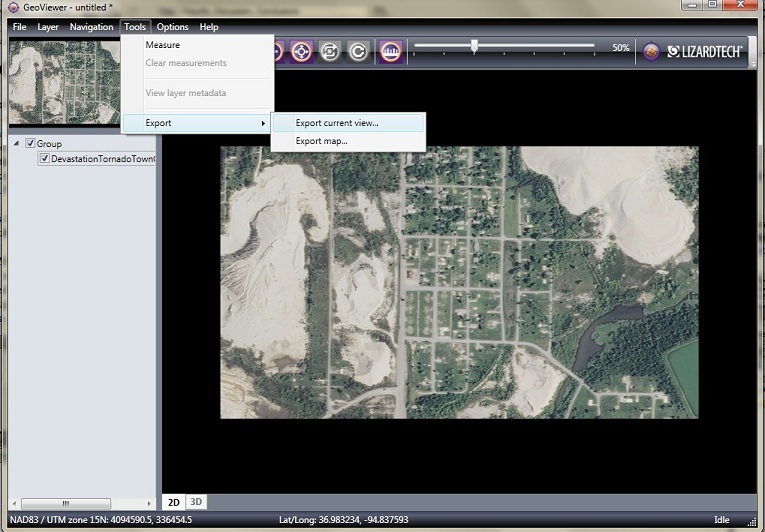 The year 2006 and 2010 NAIP images were imported into Lizardtech Geoviewer, then a smaller subscene in the Picher area was selected for both years and exported as a TIF-format image. Next, the imagery was imported into Taiga using Geotiff/Tiff and the images produced were in three light bands. Natural color composites were subsequently prepared of the three NAIP band images using the Composite feature of Idrisi Taiga (composite process explained on project Method page). Comparing closeups of the imported NAIP imagery in the Picher area in 2006 and 2010 clearly reveals devastation from the 2008 tornado which was not evident in the Landsat imagery. According to the KC2BUV archive about the storm, the path of the tornado was from Chetopa, Kansas; to Picher, Oklahoma; to Seneca, Neosho, Newtonia and Purdy, Missouri. Looking at the website’s map, the angle would be ~15 degrees from northwest to southeast. Click here to see full view of the storm's path in Picher and then return to this page for discussion of the above closer views. 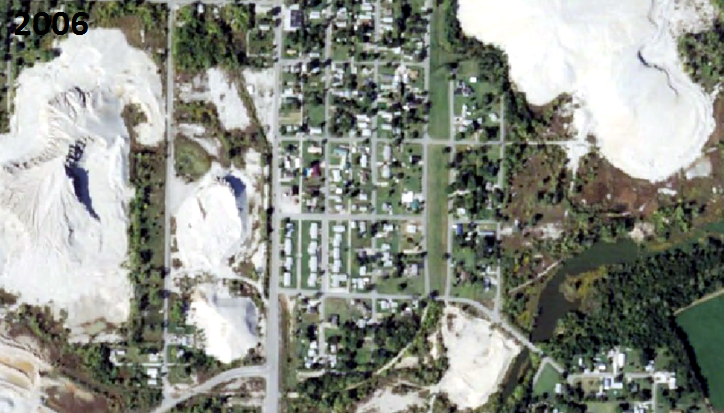 Most noticeable are the empty city blocks that contained homes and businesses in the 2006 image but are no longer evident in the 2010 image. Also, notice the trees that were to the east of the large chat pile at the western edge of the image, in the middle section of the southern edge, and at the southwestern edge of the chat pile on the eastern edge of the 2006 image. The trees are not evident in the 2010 image. The shape of chat piles have changed as a result of the tornado's path. In the above example, temporal changes in land cover, namely the loss of vegetation, buildings, trees and change in shape of chat piles are displayed for co-registered NAIP imagery and the tragic differences are easily pinpointed.